Leith Athletic 16s battled to another three points in Division 1, with a hard-earned 4-1 win over Edinburgh City Whites 16 at Forrester High School. In a balanced start to the mid-table clash, Leith took the lead when aball in from out wide on the left found Kerr Milne unmarked in the box and he leapt to nod home. Leith could well have had a second with 25 minutes played. Guy McGarry burst down the right and cut into the box, but he took one touch too many, allowing City keeper Luca Scarpa to gather the ball. City looked to create an opening before the break, but Leith continued to look strong in midfield, breaking up the opposition attack at every opportunity. Building on their midfield superiority, Leith doubled their advantage with a fine goal. Milne hit a thunderous effort from range off either post before and the referee ruled a goal. Leith almost gave City a way back into the game. City gradually pressed in attack leading to Kielan Denholm getting a shot away in the Leith box, but it lacked the power and direction to test keeper Tyler McGee. It was a brief scare and Leith composed themselves to end the half comfortably in front with some nice, controlled football. They continued to look the better of the two sides when the second half got going. They grabbed another goal to cement their lead as Cai MacDonald picked up the ball on the right of the City box before drilling the ball into the bottom left corner to make it 3-0. The goal gave Leith breathing space and for a period both sides were happy for the ball to go back and forth in midfield. Gradually it picked up again and City once again looked to press through Fraser Blackie and Daniel Abubakar in midfield. They passed the ball around well but on every occasion when they got to the Leith box, the defence kept it tight with defenders Joseph McGinty and Jude Zitara, in particular, playing well. As the game ticked towards full-time, there was still time for Leith to extend their lead. An early forward ball caught City napping at the back, allowing Stevan McCole to race through on goal and he lobbed keeper Scarpa from the edge of the box to make it 4-0. Late on City were gifted a consolation as Leith’s Mark Tennant inadvertently headed the ball into his own goal, but it wasn’t going in affect the outcome of the game. With that, the referee blew for full time, giving Leith the all important three points to help them move closer to leaders Portobello CFA 16s. Leith coach Ian Short said: “I thought the lads played well today. We didn’t give City any time on the ball and we took our chances well. We ran out easy winners in the end because of the performance. 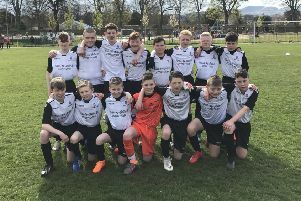 Edinburgh City Whites 16s: Luca Scarpa, Jules Carrie, Orry Heggie, Owen Gardner, Daniel Spence, Kielan Denholm, Callum Simpson, Afoladi Osibanjo, Calum Arnott, Fraser Blackie, Kyle Williamson, Sam Alexander, Daniel Abubakar, Nuhan Hussain, Zion Dixon. Leith Athletic FC 16s: Tyler McGee, Sonny Robertson, James Low, Joseph McGinty, Blair Short, Joseph Healy, Jack MacKay, Mark Tennant, Kerr Milne, Cai MacDonald, Tyler O’Neil, Guy McGarry, Jude Zitara, Kris Gaff, Jonathan Sedstrem, Stevan McCole, Jake Grandison.